Now that we are in the hottest part of the year in Arizona, the possibility of heat exhaustion is something that everyone needs to be aware of. 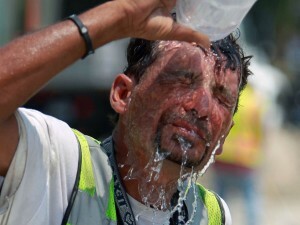 Heat exhaustion occurs when your body gets too hot. Normally, the body cools itself by sweating. When you are exposed to high temperatures for a long period of time, and don’t replace the fluids you lose, the body systems that regulate temperature become overwhelmed. As a result, your body produces more heat than it can release. Heat exhaustion requires immediate attention because it can progress to more serious heat related illnesses that could become life threatening. If you begin feeling any of the symptoms list above while working, contact your supervisor immediately and contact Medcor ASAP. They will be able to help you diagnose whether or not you need additional medical attention and/or give you steps that you can follow to help alleviate the problem. Taking medications that interfere with the body’s ability to cool itself, including antipsychotics, tranquilizers, antihistamines, tricyclic antidepressants, and beta-blockers.